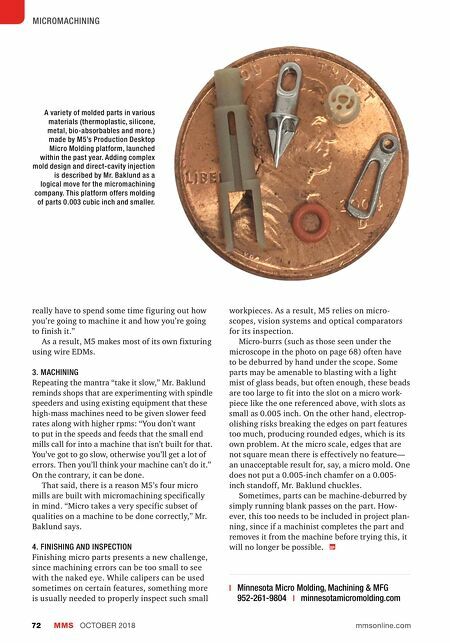 MMS OCTOBER 2018 72 mmsonline.com MICROMACHINING really have to spend some time figuring out how you're going to machine it and how you're going to finish it." As a result, M5 makes most of its own fixturing using wire EDMs. 3. MACHINING Repeating the mantra "take it slow," Mr. Baklund reminds shops that are experimenting with spindle speeders and using existing equipment that these high-mass machines need to be given slower feed rates along with higher rpms: "You don't want to put in the speeds and feeds that the small end mills call for into a machine that isn't built for that. You've got to go slow, otherwise you'll get a lot of errors. Then you'll think your machine can't do it." On the contrary, it can be done. That said, there is a reason M5's four micro mills are built with micromachining specifically in mind. "Micro takes a very specific subset of qualities on a machine to be done correctly," Mr. Baklund says. 4. FINISHING AND INSPECTION Finishing micro parts presents a new challenge, since machining errors can be too small to see with the naked eye. While calipers can be used sometimes on certain features, something more is usually needed to properly inspect such small workpieces. 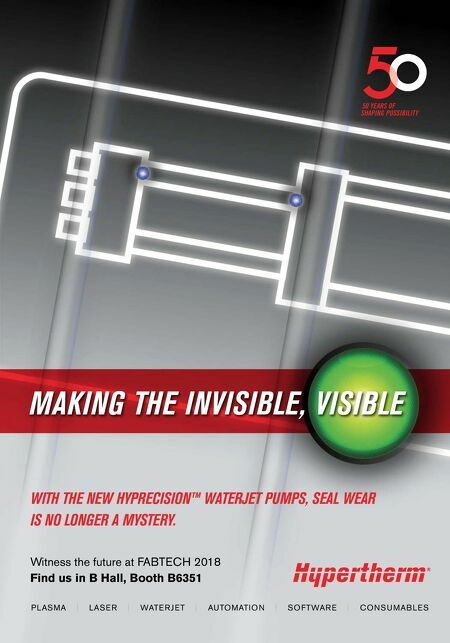 As a result, M5 relies on micro- scopes, vision systems and optical comparators for its inspection. Micro-burrs (such as those seen under the microscope in the photo on page 68) often have to be deburred by hand under the scope. Some parts may be amenable to blasting with a light mist of glass beads, but often enough, these beads are too large to fit into the slot on a micro work- piece like the one referenced above, with slots as small as 0.005 inch. On the other hand, electrop- olishing risks breaking the edges on part features too much, producing rounded edges, which is its own problem. At the micro scale, edges that are not square mean there is effectively no feature— an unacceptable result for, say, a micro mold. One does not put a 0.005-inch chamfer on a 0.005- inch standoff, Mr. Baklund chuckles. Sometimes, parts can be machine-deburred by simply running blank passes on the part. How- ever, this too needs to be included in project plan- ning, since if a machinist completes the part and removes it from the machine before trying this, it will no longer be possible. | Minnesota Micro Molding, Machining & MFG 952-261-9804 | minnesotamicromolding.com A variety of molded parts in various materials (thermoplastic, silicone, metal, bio-absorbables and more.) made by M5's Production Desktop Micro Molding platform, launched within the past year. Adding complex mold design and direct-cavity injection is described by Mr. Baklund as a logical move for the micromachining company. This platform offers molding of parts 0.003 cubic inch and smaller.